Short break? Welcome to Butley! With the days getting noticeably longer and spring around the corner, the Aldeburgh Festival programme just published, it is time to fix up a weekend away! Please consider a few days at our place in Butley. It is lovely for couples and groups up to six. It is cosy and spacious in equal measure. The surrounding countryside is great for cycling and walking and is excellent for birds. The village pub, The Butley Oyster, re-opened last year, and serves its own beers. It now hosts the village shop. In the barns there is a spanking new 21 seater cinema. Rock up with a DVD, buy a beer and pop corn, relax and enjoy! This short blog is more about the tumble than the rough – tumbling blocks if truth be known. 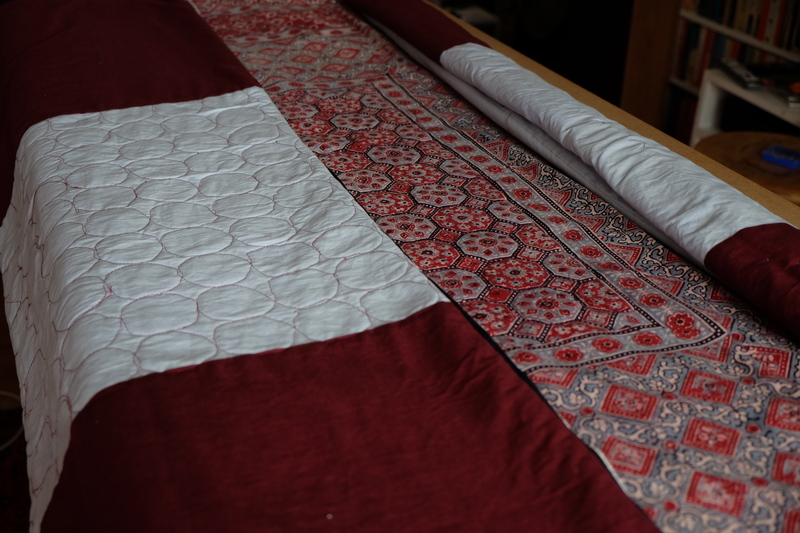 A friend had rediscovered a block-printed sheet that she had bought many moons ago on a trip to India. 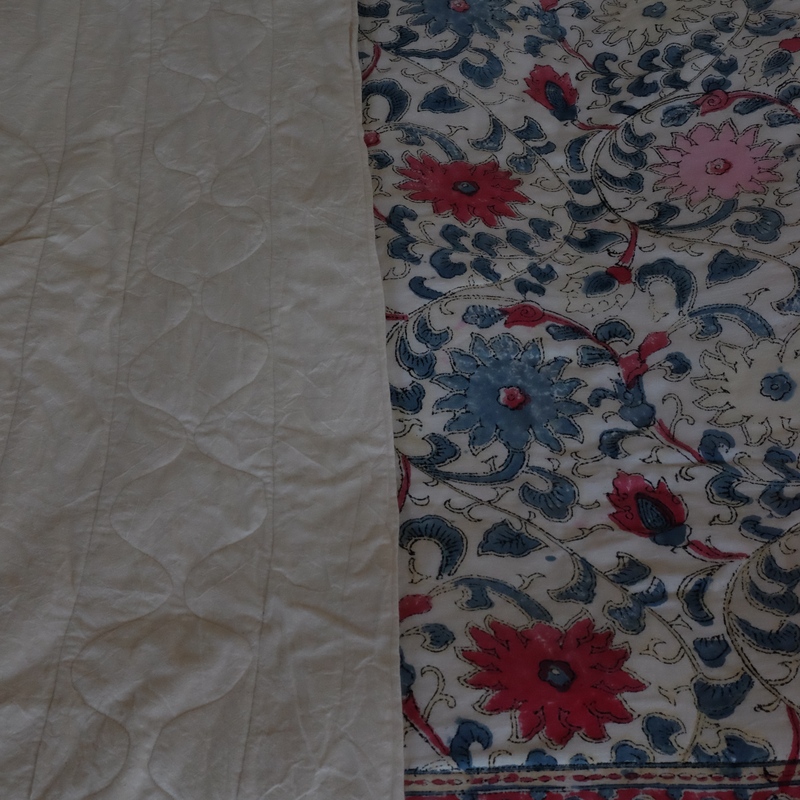 She asked me to turn her sheet into a quilted bed spread. 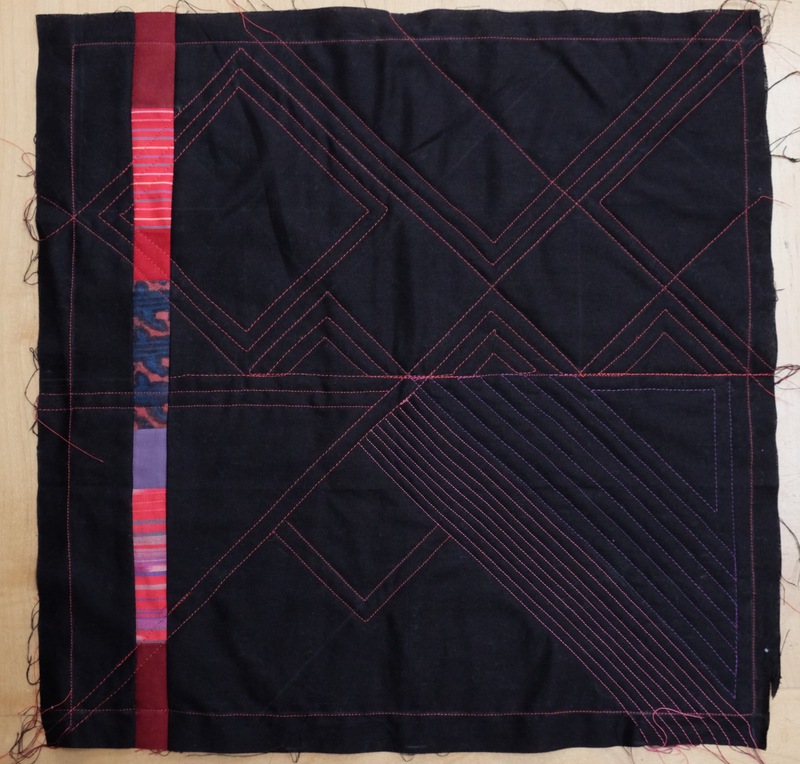 I was keen to learn how to stitch tumbling blocks and so, rather than make a plain backing for her quilt, I decided to do deviate. 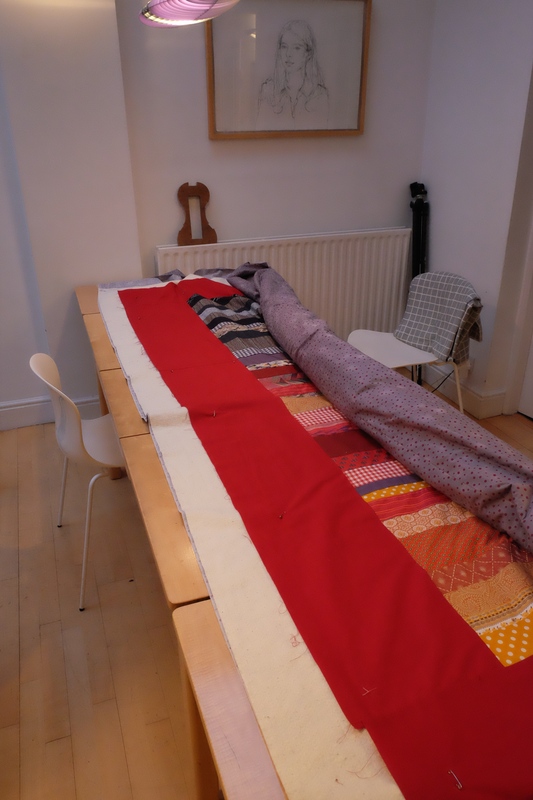 Below are photos that describe the creation of ‘Chrisie’s Quilt’. 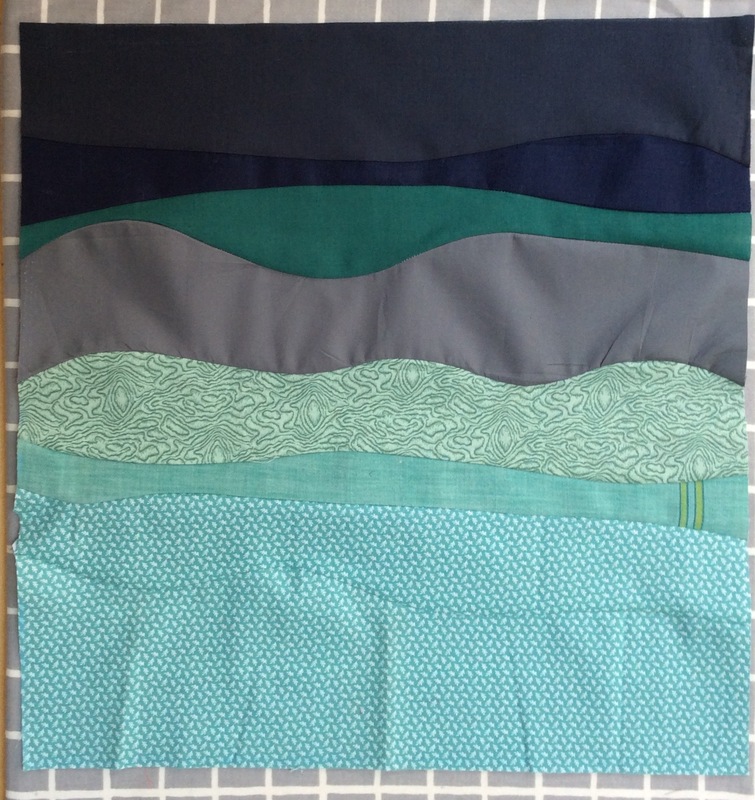 Getting quilty with free motion. 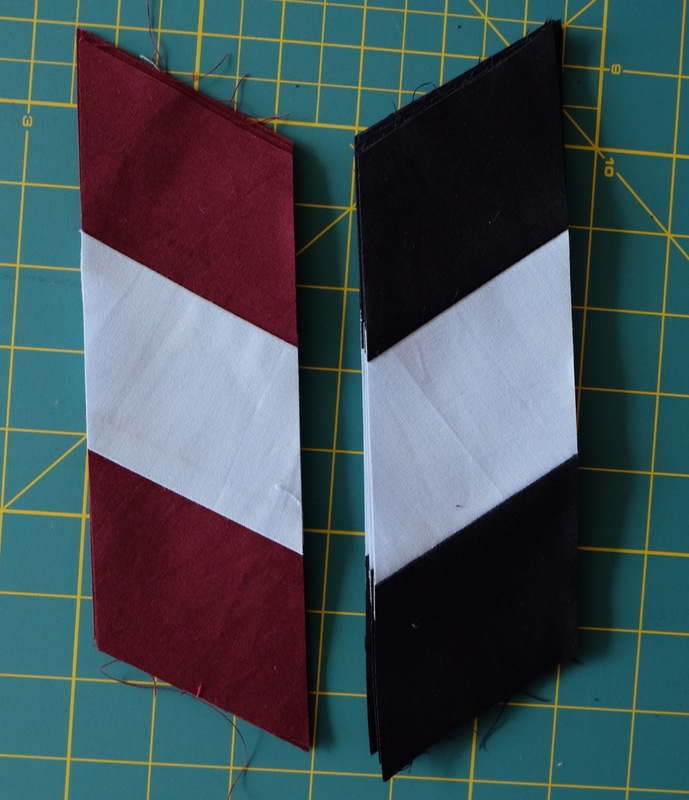 It was while learning how to free motion on my sewing machine that I discovered how to ‘lower my feed dogs’. What a revelation! Early departure at 03:45 for a flight to Madrid from lovely Luton. Temperature on arrival a mere 3 degrees centigrade. 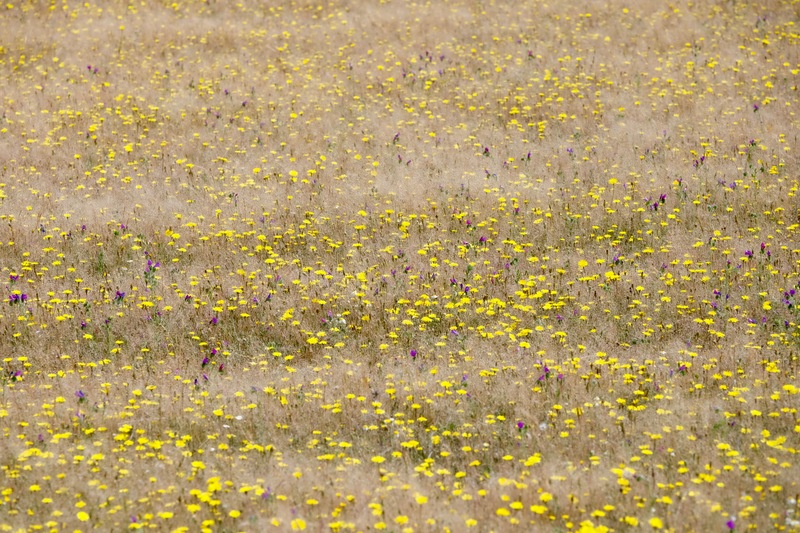 Extremadura boasts a wide variety of habitat (Cork and Holm Oak forests (Dehesa), grass land, rivers, reservoirs, scrub, mountains) and low human population with the result that it supports a wealth of wild life. Having some insider ‘birding gen’ certainly is critical for the hard-to-find species, but quite frankly, it is amazing what a non-expert could spot along the quiet roads and byways without too much effort. 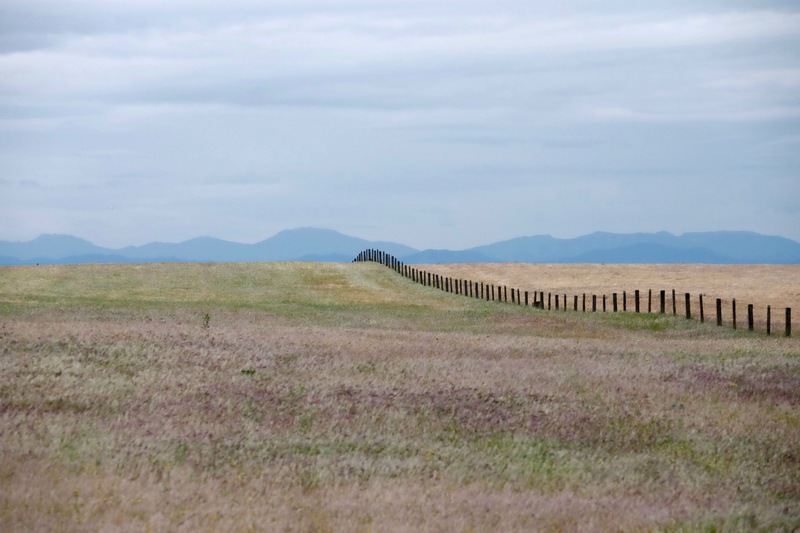 The land scape was sweeping and colourful with a back drop of the Sierra de Gredos mountains, snow capped and rising to 2,591 at Pico Almanzor. We dropped bags at Villar de Plasencia, a maze of a village where we got quite disoriented. This became the norm in most of the villages we travelled through. The road map was hopelessly lacking in detail but made for some exciting driving on incredibly narrow and sometimes steep streets, watched by bemused residents. We headed to Puerto de Tietar in Monfrague National Park and with patience were welcomed by a Spanish Imperial Eagle as well as Griffon Vultures, Black Kites and Egyptian Vultures. The following morning the weather was poor. We explored the Embalse de Arrocampo-Almaraz where there are a number of hides, ideal to escape the worst of the rain. These however proved a mixed blessing – one had a door that would not open, one had a door that once opened, would not close, forcing us to sit in a howling gale. The last had no seating, so it was impossible to see out of the hatches. Fortunately the weather cleared and hiding no longer a necessity. We saw, black shouldered kite, little bittern, swamp hen and purple heron, Spoon Bill, amongst much else. We drove to Salto del Gitano and the Monfrague Castillo in the heart of the National Park. The sun now high in the sky, Griffon, Black Vultures and Black Kites cruised, drying their wings after the rain. Also a wonderful sighting of Black Storks, far less prevalent elsewhere than their white counterpart. We climbed the steps up to the castle and then up the tower. We followed the path down to the river. The walk made me realise that our planned hike up Breche de Roland later in the summer, was going to be more of a challenged than previously reckoned, cancer treatment through the winter having knocked me back. That evening we supped on fried Dorade at Villar Real de San Carlos. The following morning we were up for the dawn and out looking for Western Orphean Warbler. Alas it eluded us due to gale force winds and driving rain. Next stop Embalse de Talavan. Then on to Rio Almonte to seek nesting Alpine Swifts. After a while we realised we were at the wrong river crossing. Eventually we found the correct bridge but no Alpine Swifts. However, we did get a rare sighting of a lovely Golden Eagle. That evening we landed at Casa Rual El Recuerdo, just south of Trujillo, home of Martin Kelsey whose knowledge of the bird populations is unsurpassed. The following morning armed with Martin’s clear directions we went in pursuit of Great and Little Bustards, Black-bellied and Pin-tailed Sandgrouse and Rollers all of which we saw. At sun down, we walked 2/3rds up one of the village lanes and perched ourselves on a sun-warmed stone wall. Holding our breath, we listened for a Red-necked Nightjar. The weather was perfect, warm and still. Insects, particularly moths, in abundance. And then we heard it – a car alarm. That’s it! The bird soared right over our heads, circled, and came back over. A world tick for Andy. Up and out early on our final morning to seek out more Bustards. We got them. A gaggle of males, females all hidden away egg sitting. There’s a Cattle Egret in there somewhere! Then we took a slow route back to Madrid crossing a great plain between Belen and Deleitosa where we came across a Vulture fest in full swing! 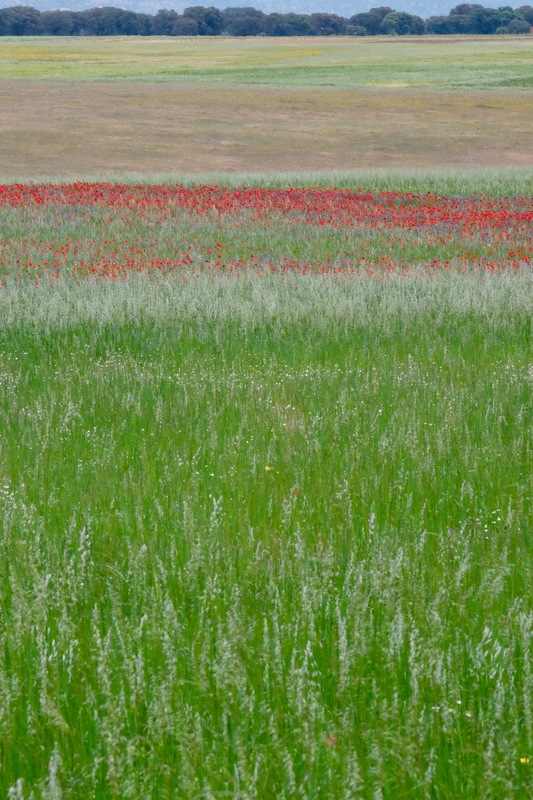 Then on through Valdecanas de Tajo, Bee Eaters and Theckler Larks at close range. A mad dash to the airport followed. No time to pick up petrol. Walked straight through on onto the plane, last on. Great trip! Something is needed in the aftermath of the election to ease the pain. So here is an offering from me. After completing the fox and panda quilt I had a bit of a creative spurt. 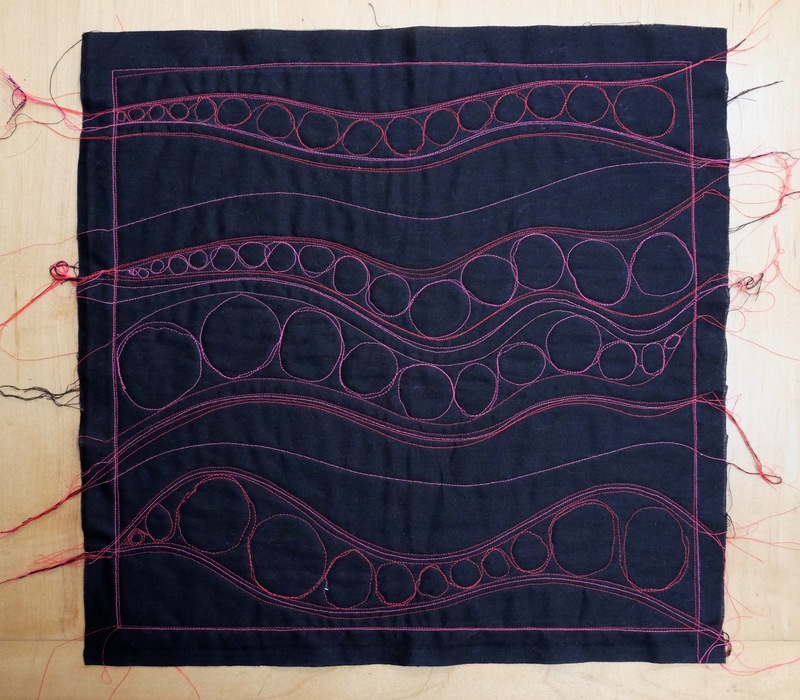 I was keen to learn how to make curvy seams and also to try my hand at free motion quilting. I was inspired by all manner of things I had seen on Pinterest and also by Leah Day who runs a fantastic series of ‘how to’ videos on YouTube. 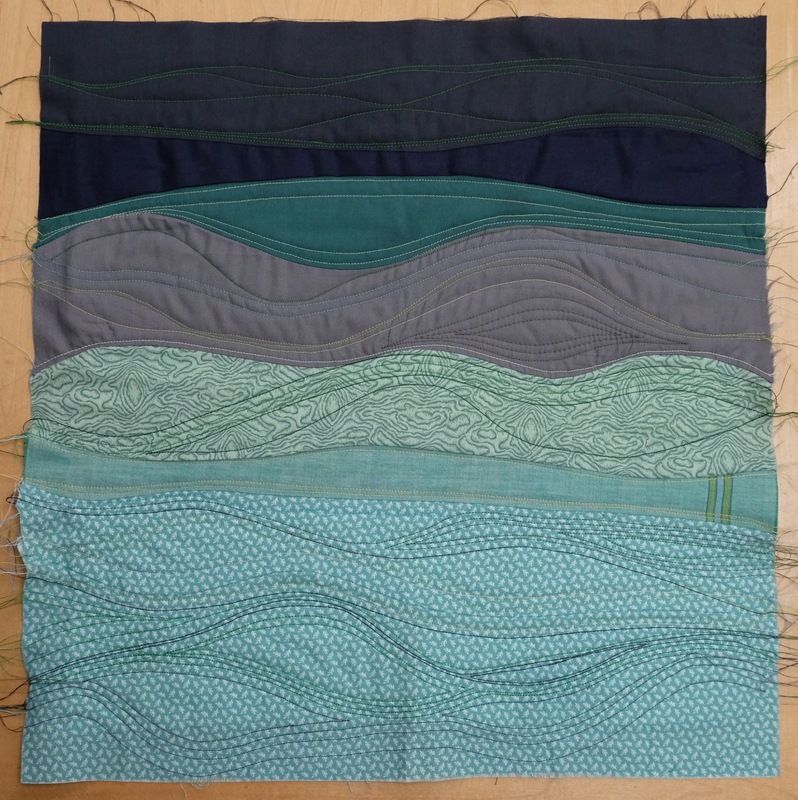 Each piece is 40cm x 40cm so easily manageable and ideal for a cushion covers. Curvy seams – harder than it appears at first. 2) Ebola Why Ebola? 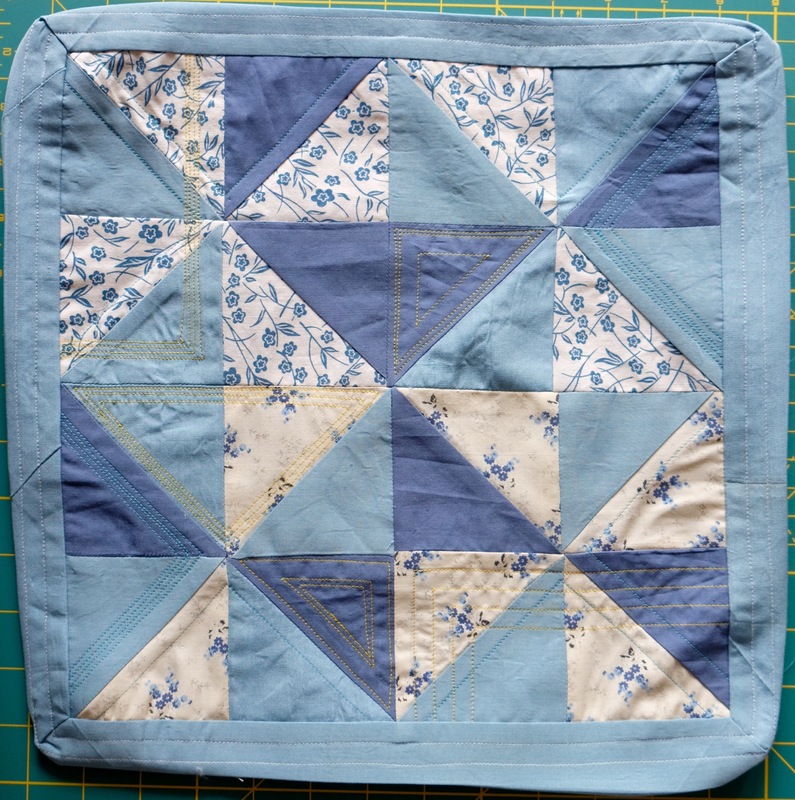 Because whilst I was making this block, I was listening to a remarkable audio diary of a young male medic setting up a new treatment centre in Sierra Leone. A former research colleague of mine said this block reminded her of C. elegans, famed for its role in uncovering the mysteries of animal development, and the first animal to have its genome sequenced in full. No doubt I will return to this as inspiration down the line! 3) Chocolate Frigates Another odd title but there is a recurring theme here. This time I was listening to a radio 4 drama about a navel chef preparing a grand meal for the top brass while coming to terms with the departure of his son to the front line in Iraq. 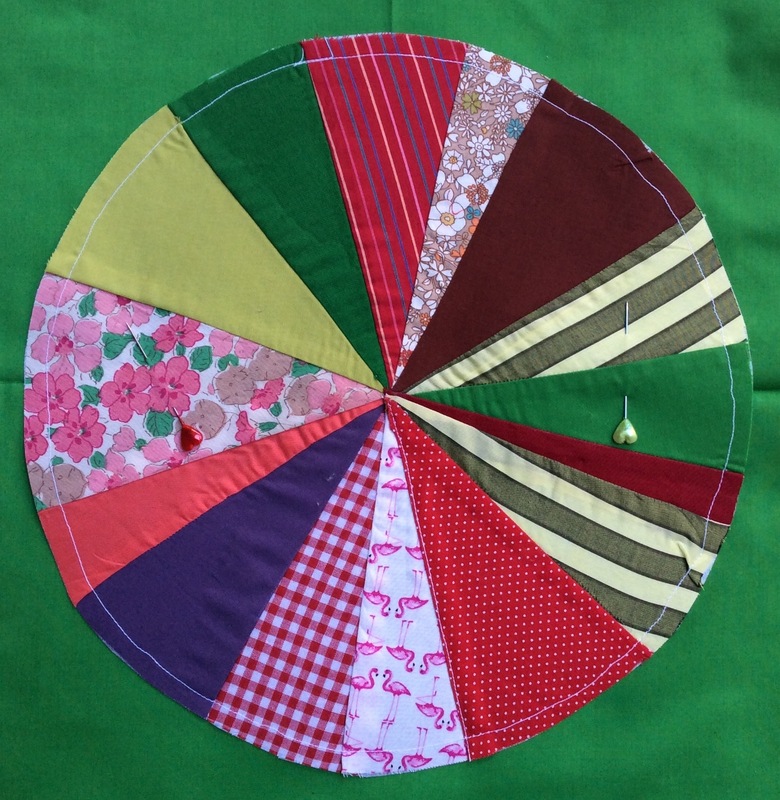 4) Pie Chart Actually this one was not accompanied by a radio show. This block has its roots in the chart now supplied by HMRC with personal tax forms. I never thought that tax would provide a source of inspiration! Clearly I evened out the spending but this was just for artist effect. 5) Half square triangles with gold and blue top stitching This one was made as a gift for my sister. The pale yellow fabric came from a dress that she wore when she was 12. The light blue silk belonged to our grandmother. 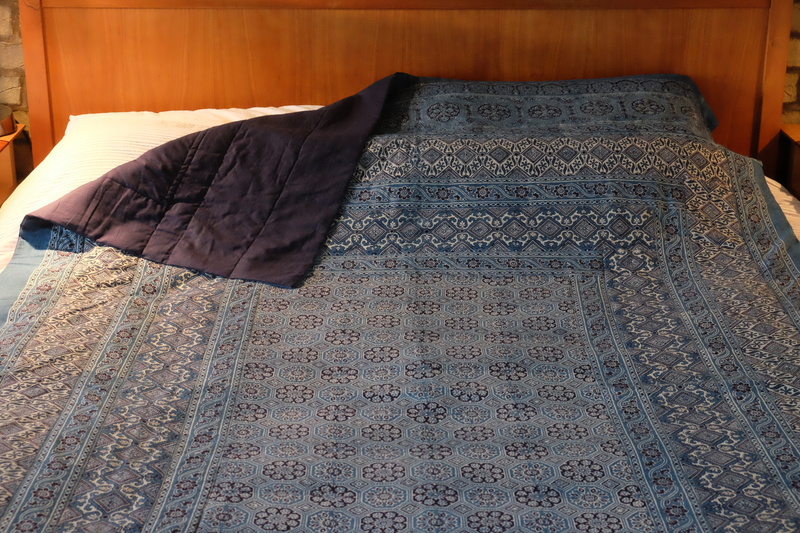 The darker blue cotton was part of the lining of an old curtain of mine. 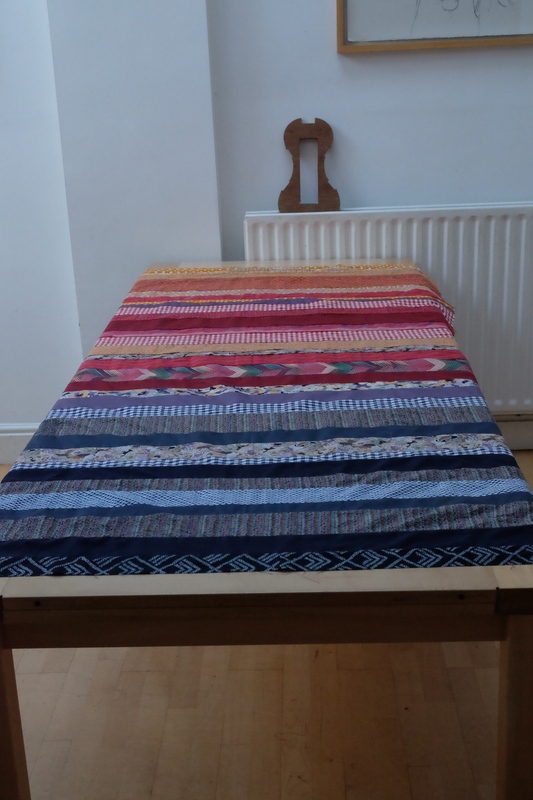 In December 2014 I got a quilt commission from my good friend J. As the proposal unfolded it became clear that what was being sought was something far far more complicated than I had undertaken before. The specification was for a double quilt including a fox, a panda, to go in a room with a cappuccino coloured wall. Rather than let the commission go, I decided to skill up and learn how to patchwork. 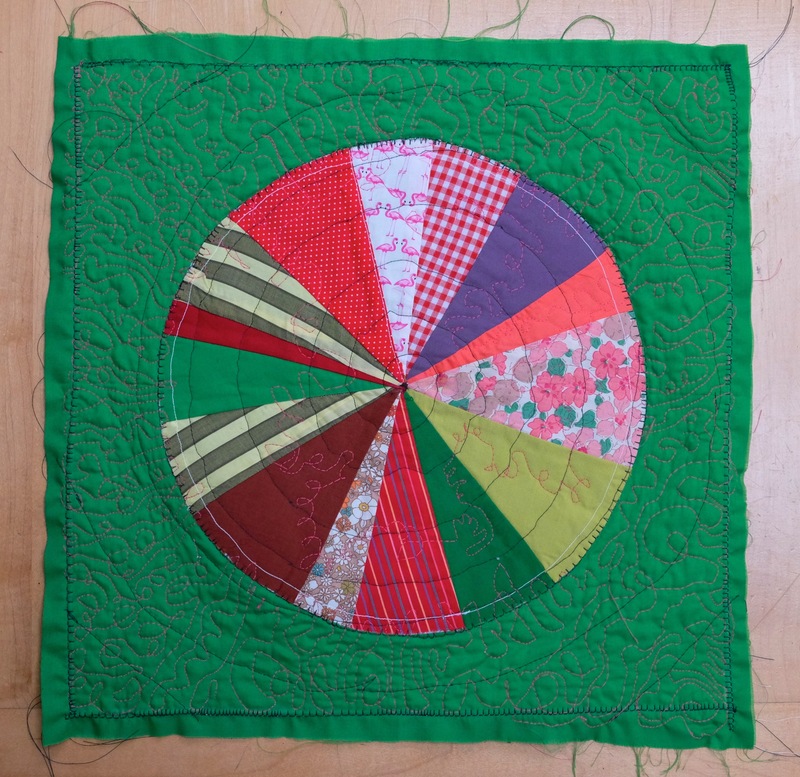 My mother had been an obsessive and hugely creative hand quilter. 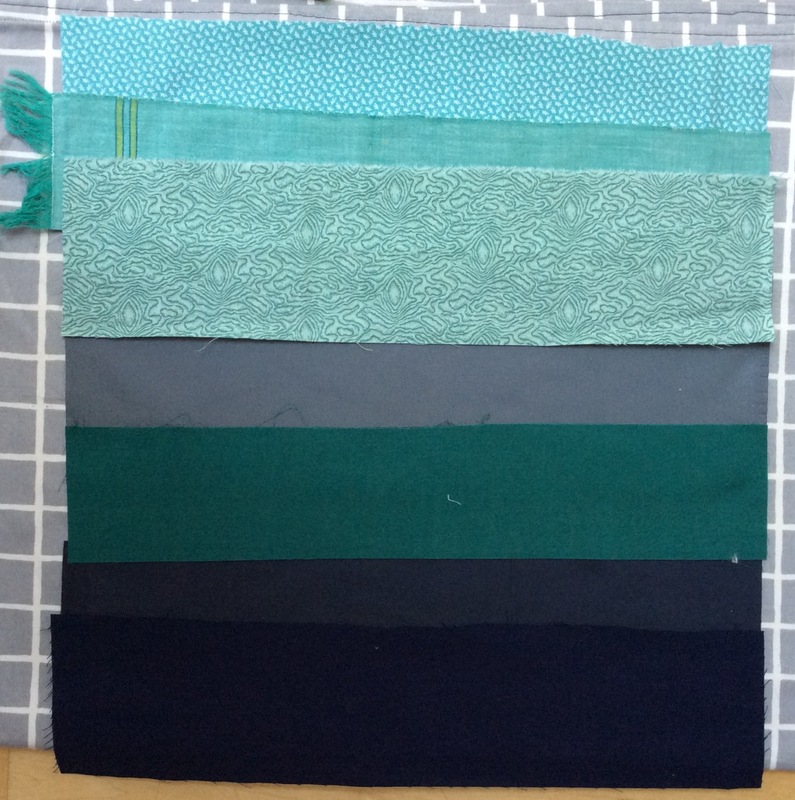 Much of her collection of fabric had been given away when dementia took her mind, but on clearing the house after my father’s death, a couple of large bags containing fabric scraps and samples came to the surface. What a fantastic discovery that was. 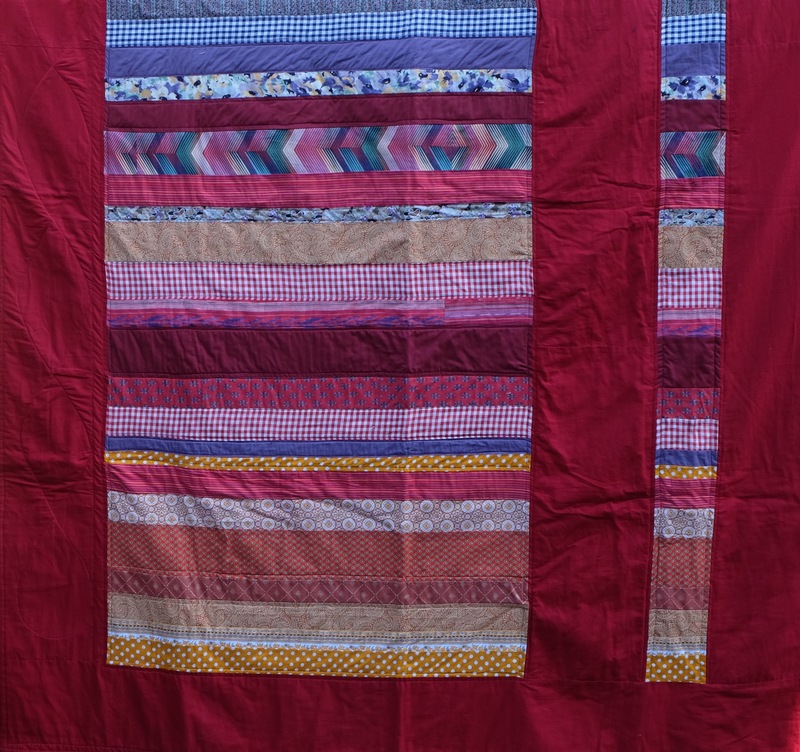 The patchwork quilt above is destined for Criquette, who has cared for my family at moments of real trauma. 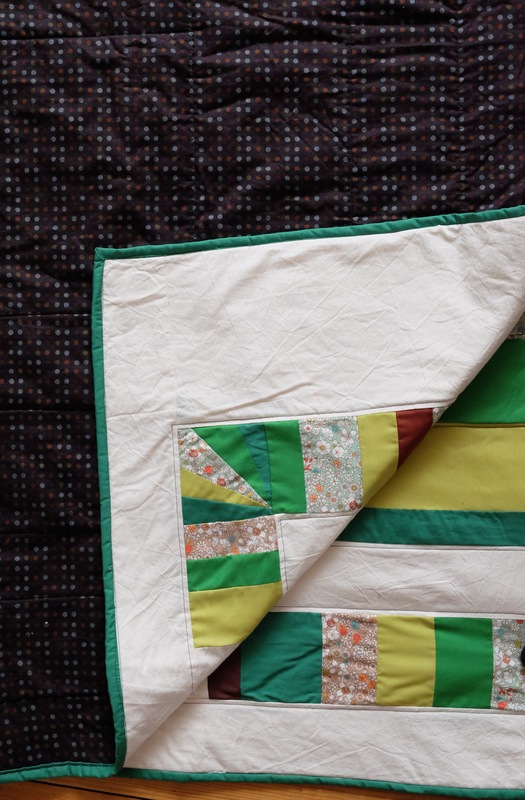 Embedded in her quilt are fabrics that once clothed each member of my immediate family. Unlike my previous quilts, this one includes a binding, complete with mitred corners, another advancement to my technical arsenal. 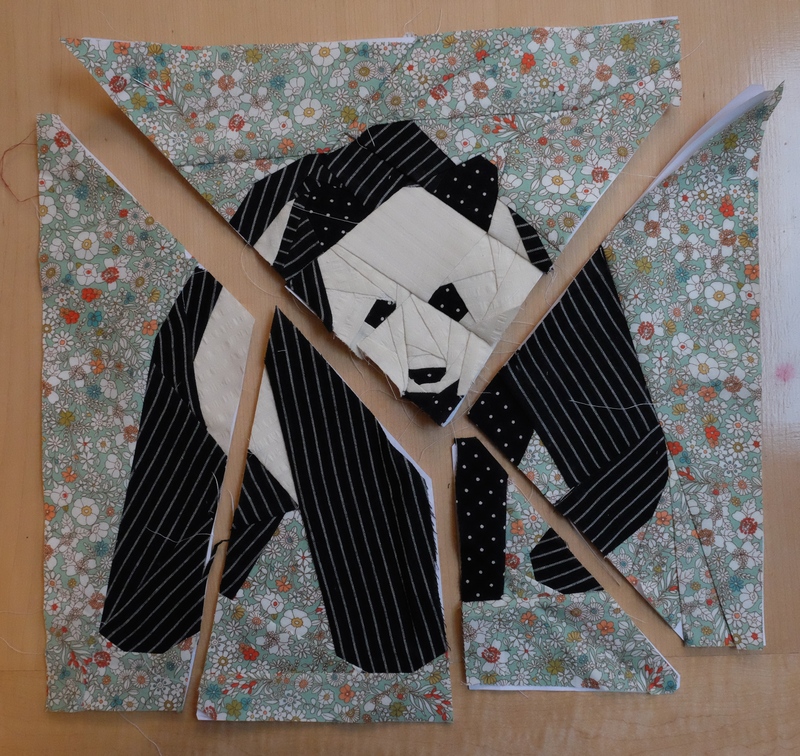 Having learned the basics of patchwork I set about the Fox and Panda quilt for J, or more specifically, her daughter who lives in San Francisco. 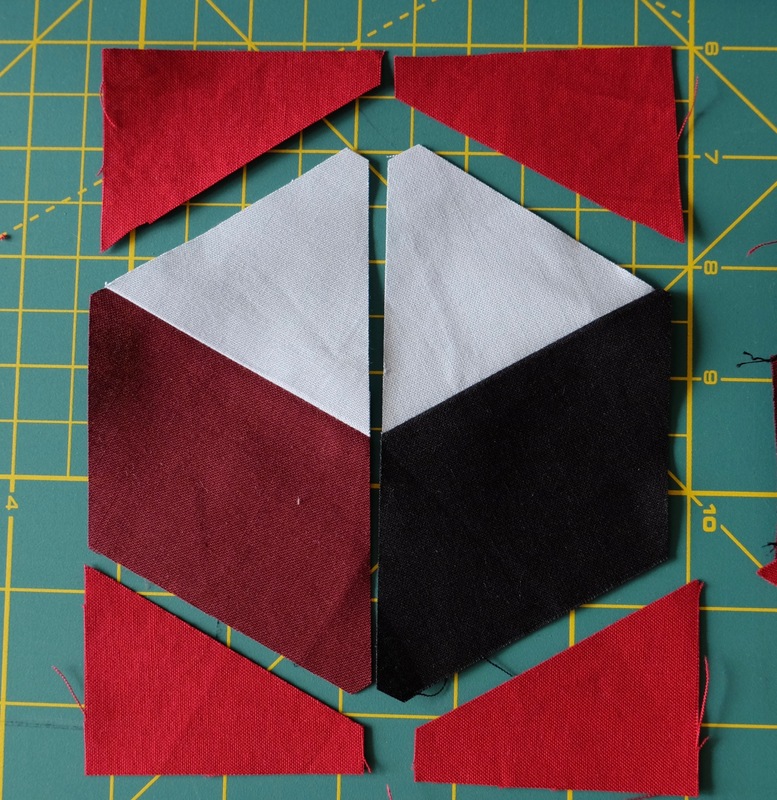 She sent me a link to Schenley’s paper pieced fox pattern which I bought on Etsy. I thought it would come with some instructions but there were none. 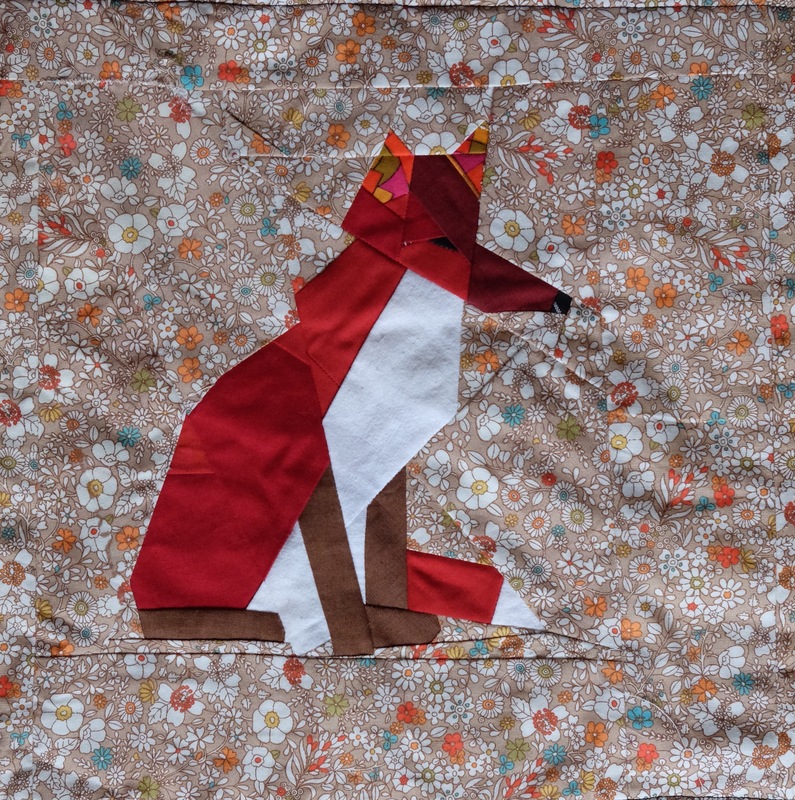 So I spent hours learning about paper piecing on YouTube and then made the fox out of scraps. It turned out ok. The panda was harder to deal with. I searched high and low for a pattern and eventually settled on a rather complicated design by Juliet from Tartankiwi. There are 13 individual pieces of stitched fabric in the nose alone! Having cracked the fox and panda, I began to think about the overall design and colours. Slowly the quilt began to take shape. ‘What joy it was to unwrap something so gorgeous. We were stunned with the quilts sumptuous colours. It will be an heirloom for our family to treasure’. ‘A huge thank you for this amazing quilt! It looks absolutely beautiful and really fits into our home perfectly. The amount of detail and care that clearly went into it are amazing, thank you again. I know it was a huge undertaking so we’re super appreciative’. The bright red fabric, the calico and wadding were bought online from Empress Mills who offer excellent priced solid cottons. 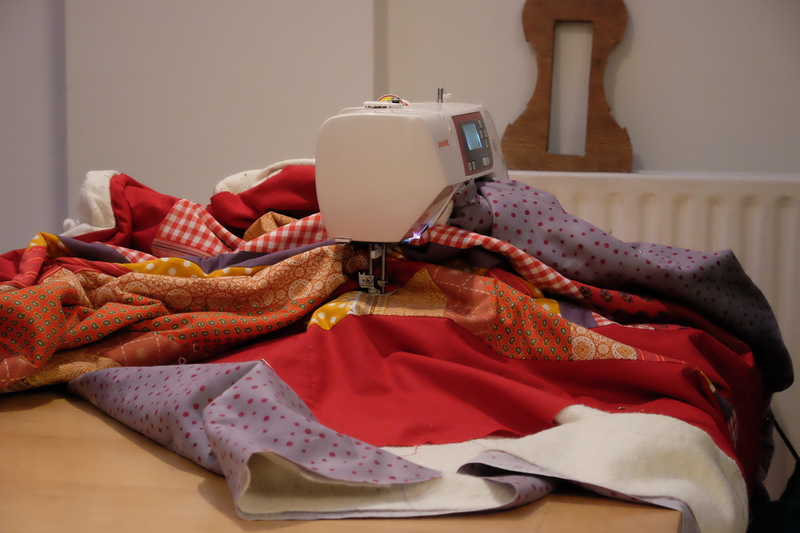 Backing fabric for both quilts was bought from Sew Creative in Cambridge. They are expensive, but their collection is good. 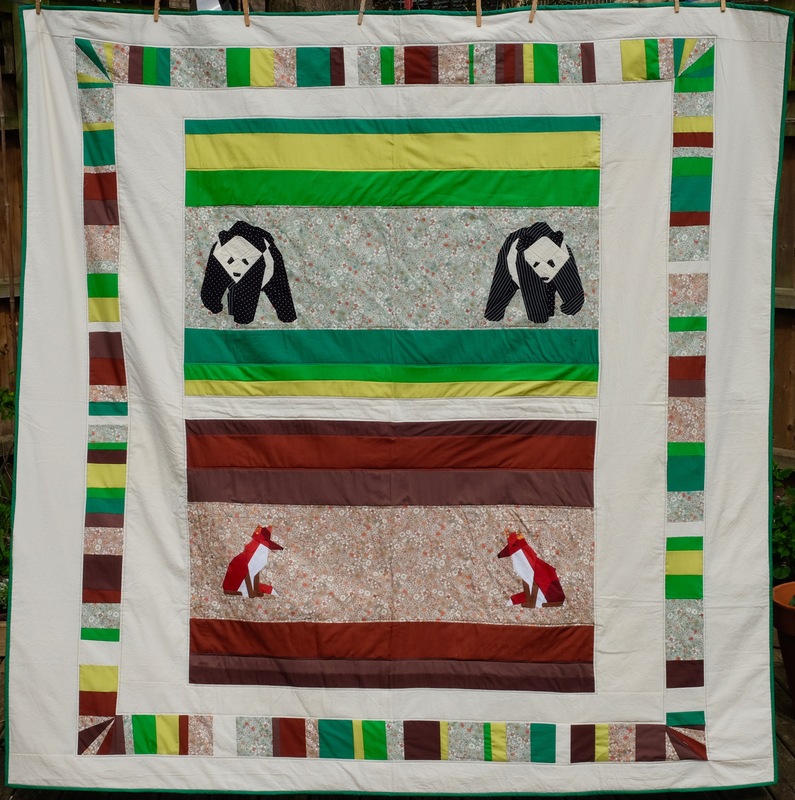 The floral prints, greens and browns used in the panda quilt were bought from MT Fabrics, one of several fabulous Indian fabric shops on Goldhawke Road in west London. Last October I needed to make a special present. 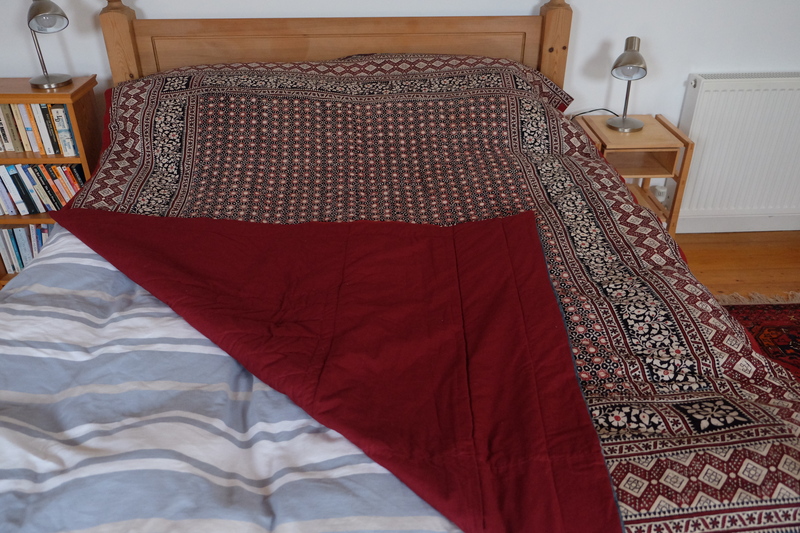 I had a lovely piece of block printed Indian fabric that had been lurking in back of the the cupboard for years. I got it out and decided to turn it into a quilt. I dropped into a tailors/dressmakers on Chesterton Road but realised that to have it made up professionally would cost a fortune. So I set about doing it myself. I used a very basic technique to make the quilt. I made several more in quick succession. One for Derek, and the one below for Imo. 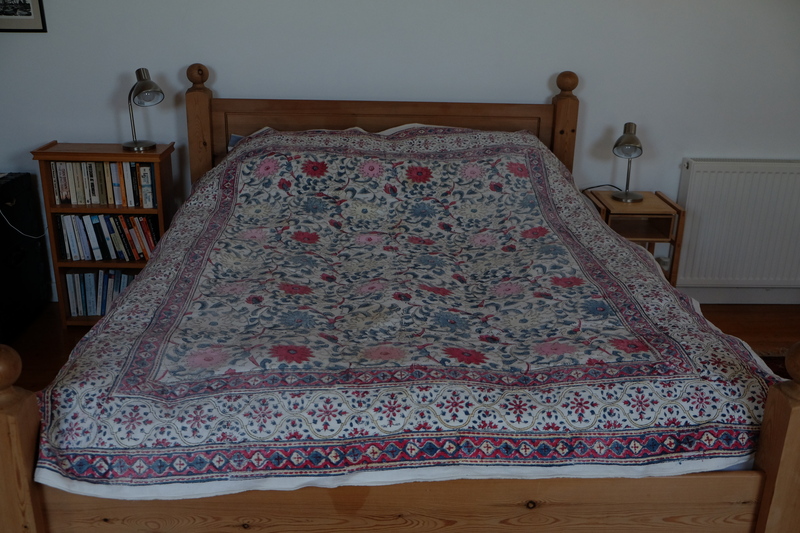 I then made a cosy quilt from a special table cloth that belonged to my grandmother. Many a family meal had been enjoyed on this cloth and so it represented some precious memories. As it happens, I wanted my father’s body to be to be wrapped in it when he wet to his grave but in the event this could not be arranged. If I could not wrap the dead, I would wrap the living. I backed it with Calico from Empress Mills where I also bought a job lot of batting – 7m by 3.15 to be exact. They were good value, good quality and prompt. I got slightly more adventurous with the stitching as you can see. I have been working from home for almost a year now and trying very hard to balance time spent at the computer with other creative things. My most recent exploit in this regard, has become a bit of an obsession. The video below tells the story. It lasts just over a minute. 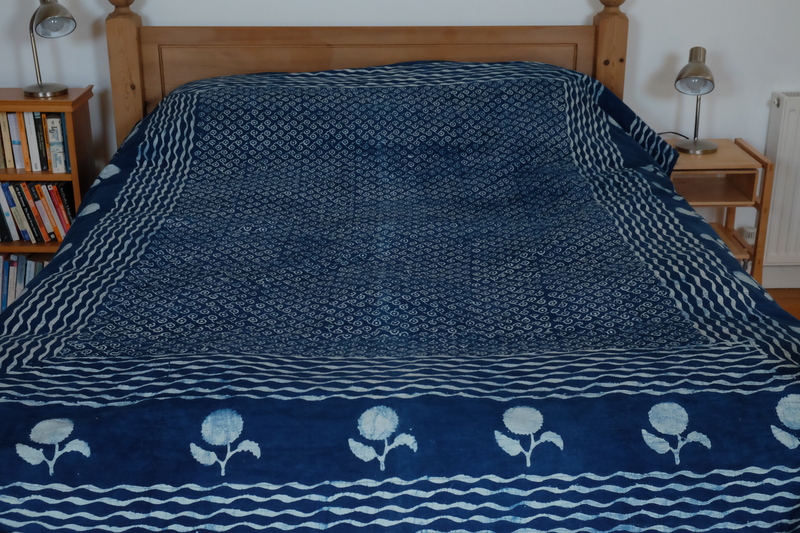 The material cost of the single (150 x 230cm) Indian block printed blue quilt featured in the video (front, back, wadding and thread) came to £80. It took me 9 hours to make. 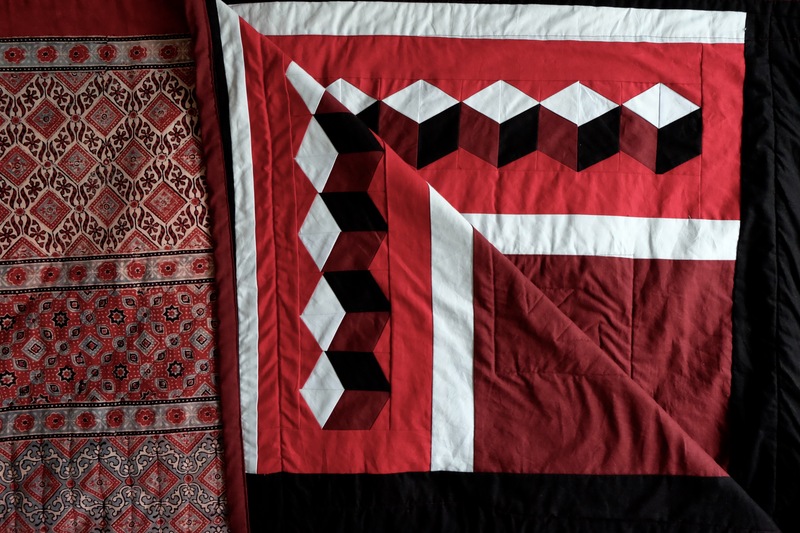 If you would like to own or to gift a lovely quilt to a friend or family member, then please make me an offer that covers the material costs and something for my time. 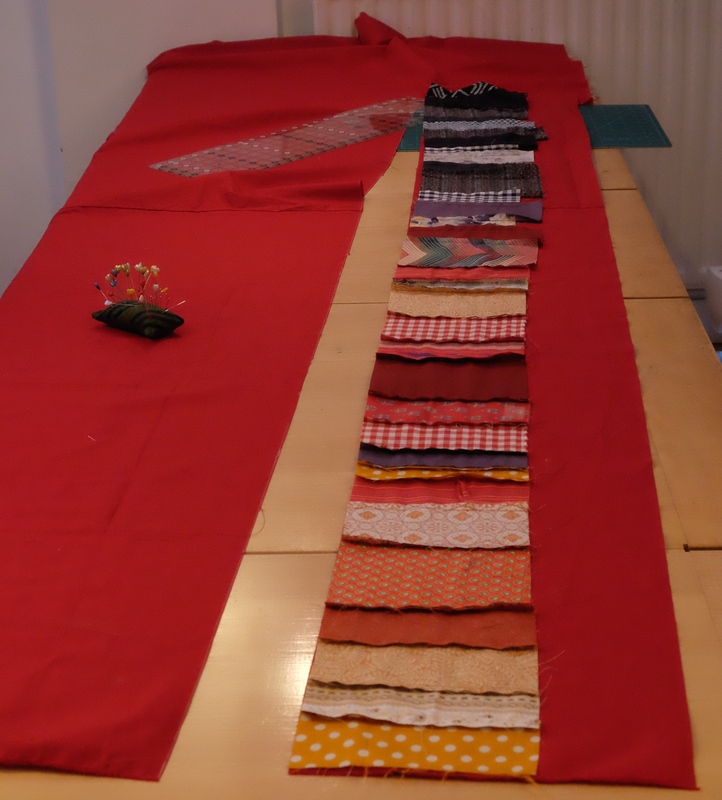 If I recieve more than 4 orders I will buy backing, wadding and thread in bulk which will cut the costs. 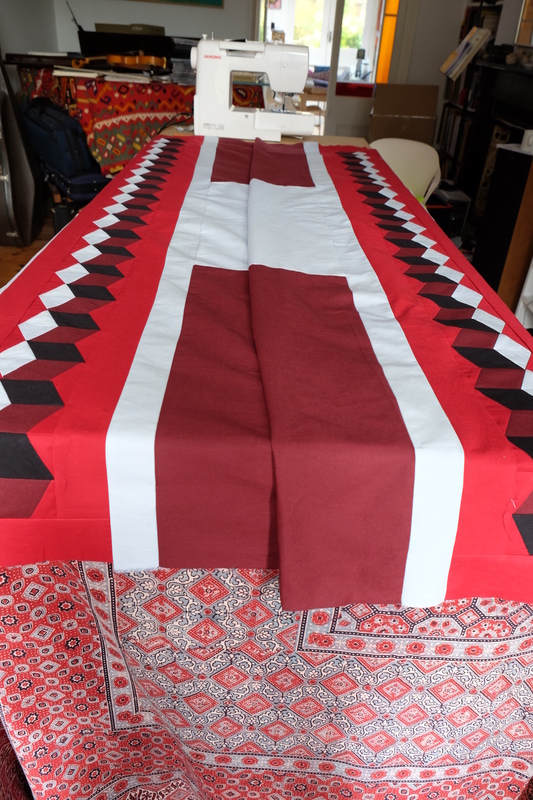 I have not yet found another supplier of such fine block printed cloths, but I am thinking of branching out into other beautiful fabrics and even printing some myself. The obsession grows! 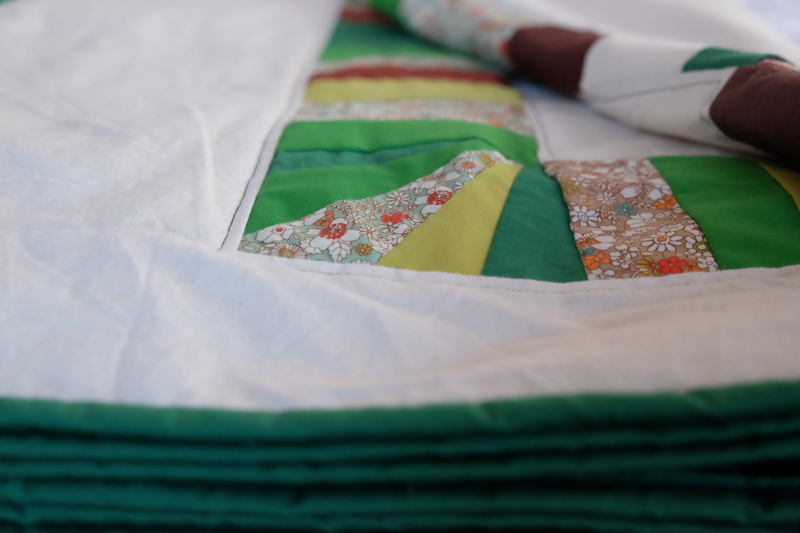 Email or drop by to discuss your quilty order!